Home › What’s the Best Golf GPS Device? What’s the Best Golf GPS Device? With golf season finally here, its time to revamp your golf bag and add a new piece of equipment; a brand new golf GPS. Lets face it, you aren’t Tiger Woods, and you probably don’t have your personal caddie, but that doesn’t mean you can’t play like the big boys! Whether you golf alone, with a group of buddies, or just trying to fit in with some clients from work, the best golf GPS device you can get your hands on will surely help improve your game. What is a Golf GPS? Unless you are golfing with a caddie, finding distance and selecting the right club often involves a lot of guess work. A golf GPS unit will help you solve these problems. Golf GPS devices are especially useful for playing on new courses that you are not familiar with, or if you just want to shave a few strokes off your score. 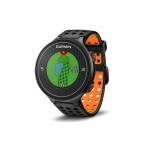 A typical golf GPS device in either a watch form or handheld device that looks a little bit like a smartphone. Speaking of smartphones, there are now also plenty of great golf GPS apps for iPhone / Android devices. By tracking your location, the GPS will be able to tell you more information than you will ever need; such as your last shot length, distance to the pin, location of hazards, and even elevation changes on the hole. Handheld devices tend to provide a bit more information, as well as useful features like scorecards and advanced stat tracking. GPS watch devices, on the other hand, provide more bare bones data, but are much more convenient to use. The choice is up to you! Have you ever lost track of where you are on the hole? Not quite sure how far that hazard is? Unfamiliar with a new course’s greens? Using a golf GPS device could be the saving grace between you keeping your cool or not. The ability to know your distance to within inches is amazing, and some units will even tell you the right club to choose and amount of muscle needed through your swing. The best golf GPS units also offer the ability for you to sync up and add additional courses and data if you need to, which not only helps you, but other users as well. By creating a growing database of courses, it puts more information in the hands of golfers around the world, hopefully resulting in better scores for you and your friends. One of the main knocks against GPS units is that some require an annual or monthly service charge. Golf is already one of the most expensive sports out there, and fancy tech like a GPS certainly doesn’t help your wallet. Fortunately, most of the newer devices do not require any annual or monthly fees. When it comes to the best golf GPS devices though, expect to spend in the $250 and up range. Entry level devices generally go for around the $100 – $150 range. If you are a serious golfer, this shouldn’t be too big of a problem; you just may need to hold off on buying that new driver. Here are our picks for the five best golf GPS devices based on a combination of features, functionality, style, and price. We have included both watches and handheld devices. If you want to check out the best golf GPS apps for your iPhone, click here. For the low cost of just $120 $78.99, this GolfBuddy Voice GPS is by far the best value-buy on the market if you are looking for an entry level GPS. Not only does the GPS unit show your location on the hole and the distance to the pin, it also talks to you. With its compact size of just 1.7″x1.7″ and one ounce, it is also the smallest unit on the market. The versatility of the unit allows it to be clipped to your pants, hat, or club bag and comes with over 40,000 courses on it right out of the box. It can also be used as a watch with the purchase of a GolfBuddy wristbrand. The GolfBuddy Voice GPS has no additional costs or fees associated with it, and is our choice as the best-value golf GPS units on the market today. 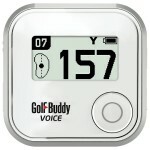 Check out the newer version — GolfBuddy Voice 2 here! 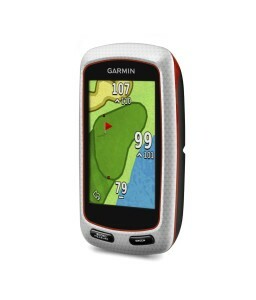 This top rated handheld golf GPS unit just so happens to be made by the leader in GPS technology, Garmin. The G7 comes with a large, bright full color, sunlight-readable 2.6″ inch screen — perfect for those who hate squinting at small screens. It is compact and durable, while also being waterproof, making it the best option for those who golf in all seasons — rain or shine. The unit weighs just 3.4 ounces and provides up to 15 hours of battery on a single charge, perfect for those multi-round golf trips. The G7 comes pre-loaded with 30,000 courses , and free updates for the lifetime of the devices. Of course, it also gives more distance measurements than you can shake your fist at (front/middle/back of green, hazards, layup points, precise pin locations, etc). A unique measurement feature G7 is its “PlaysLike” feature, which automatically adjusts distances for uphill/downhill shots. This is especially useful for people who overestimate themselves, and always leave it short on elevated greens (you know who you are)! The G7 also provides advanced stats, and a variety of scorecard options, so you can analyze your round, and track your improvement (hopefully). You can also set the device up to receive emails and messages from your phone! With its variety of useful features, and accurate measurements, the G7 is easily the best handheld golf GPS device on the market today! 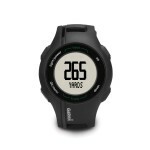 If you want the Garmin technology but feel that the G7 offers a little more than you need, Garmin’s S1 wrist watch will fit the needs of most golfers. Coming in at under $140, the wrist watch comes equipped with a waterproof 1 inch LCD display and even has a built in odometer. This watch will provide plenty of course options for you, as it comes with over 14,000 courses from the US and Canada and is one of the most popular golf GPS units available within its price range. While it isn’t as location specific as the G7, it does offer the ability to choose whether you want to see the distance to the front, middle, or back of the green, which can be pretty handy. A drawback of the S1 is its weak battery life compared to newer products on market– the battery will hold a charge for 3 weeks in watch mode, but in GPS mode it will only last for 8 hours (about 2 rounds). Despite being the oldest products on the list, the S1 still holds its own against many of the newer devices. 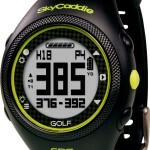 If you are looking for a simple, high quality golf GPS watch for a good price, then the S1 could be for you. 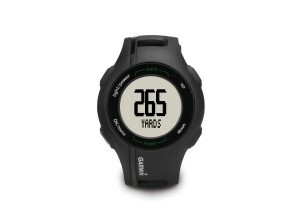 Buy Garmin S1 Golf GPS Watch here! 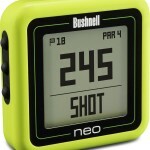 The Neo Xs is the flagship golf GPS device from one of the industry leaders, Bushnell. It is very thin and extremely lightweight (just 1.8 ounces/ 51 grams), while also packing more features than you can wrap your head around. It comes pre-loaded with over 33,000 international courses (with free download updates) — perfect for you golfing globetrotters. As you approach a golf course, the watch will automatically begin to load the course info, so you don’t need to fumble through screens looking for the correct location. Once you start playing your round, the watch will also automatically progress through each hole, so you can worry about your swing instead of how to your new tech. The Neo Xs provides accurate yardage distances to front/back/center of greens, hazards, and also layup distances. It also will tell you how far your shot distance is. One of the best features of the Neo Xs is its FANTASTIC battery life. On a single charge you can expect over 12 hours of GPS tracking (about 3 rounds); and if you use it as just a watch, the batter will last for two full years! About the only downside of the Neo XS is that some people have experienced the band breaking after limited usage. 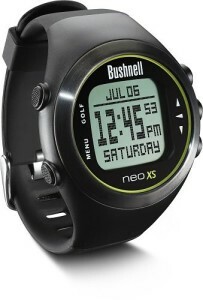 Overall the Bushnell Neo XS is one of the best golf GPS devices on the market. For a price of just $209 $199.99, it is also one of the best value deals available! 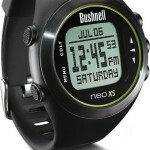 Buy Bushnell Neo Xs Golf GPS Watch here! 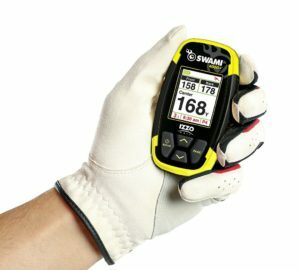 Looking for a budget friendly handheld golf GPS? Then, the IZZO Swami 4000+ is your best bet. For just over a hundred bucks, this simple, portable GPS has everything you need. It comes pre-loaded with over 30,000 courses from around the world. There are also no subscription or download fees for the updating the device. The GPS gives you distance measurements to the front/center/back of green, hazards, and even doglegs. The LCD screen is large, clear, and easy to read, so you will not have to squint, even under bright sunlight. The device also features auto-hole advance, and shot distance measurement, so you don’t have to worry about pushing any buttons as you progress through the course. One downside of this device is that auto-hole advance feature doesn’t work unless you bring it with you to the green. This is not a big deal if you usually walk the course or have it in your pocket, but if you leave it in the golf cart, it could be a bit inconvenient. 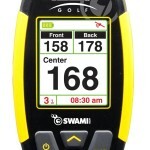 Overall, the Swami 4000+ may lack some fancier features (3D maps, scorecards, etc.) of the higher end devices, but if you are looking for a no-frills, accurate, and reliable golf GPS, then this is the device for you. For just around $100, you won’t find a better deal than this! Buy the IZZO Swami 4000+ Golf GPS here! 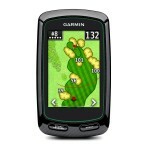 Garmin Approach G6 Handheld Golf GPS Handheld $190 4.2 Large, color touch screen for easy viewing. 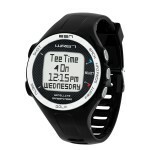 Epxresso WR-67 GPS Golf Watch Watch $149 4.3 GPS Golf Watch that is simple and works well. 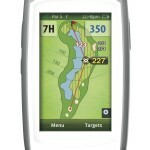 IZZO Swami 4000 Golf GPS Handheld $95 4 Affordable alternative that gets the job done. 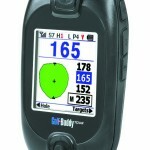 GolfBuddy Platinum GPS Rangefinder Handheld $255.50 3.5 Touch screen could use some work. to buy this one also can be worn as normal watch battery life is super just charge like your mobile phone if golfing every second day. so easy it knows where you are playing sets it self up and away you go.